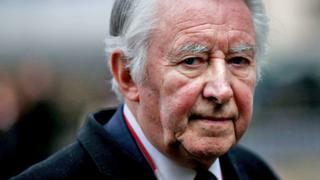 The Liberal Democrats have suspended former leader David Steel over remarks he made to a child abuse inquiry about the late MP Cyril Smith. Lord Steel said he asked Smith in 1979 about claims he abused boys at a Rochdale hostel in the 1960s. He said he came away from the conversation "assuming" that Smith had committed the offences but claimed it was "nothing to do with me". A Scottish Liberal Democrat spokesman said an investigation would take place. The spokesman said: "Following the evidence concerning Cyril Smith given by Lord Steel to the Independent Inquiry into Child Sexual Abuse on 13th March 2019 the office bearers of the Scottish Liberal Democrats have met and agreed that an investigation is needed. "The party membership of Lord Steel has been suspended pending the outcome of that investigation. That work will now commence. "It is important that everyone in the party, and in wider society, understands the importance of vigilance and safeguarding to protect people from abuse, and that everyone has confidence in the seriousness with which we take it. "We appreciate the difficult work that the Independent Inquiry into Child Sexual Abuse is doing on behalf of the victims and survivors of abuse, and the country as a whole." The Independent Inquiry into Child Sexual Abuse (IICSA) heard that no formal inquiry was held by the party into the claims against Smith, which were investigated by the police in 1969 but no prosecution was brought. Smith served as a Labour councillor in Rochdale in the 1960s before becoming the Liberal and then Liberal Democrat MP for the town between 1972 and 1992. Allegations that he abused a number of boys found a wider public spotlight after he died in 2010. Lord Steel, 80, told the inquiry he discussed the allegations with Smith in 1979, after an article appeared in Private Eye. He said Smith had told him "it was correct, the matter had been investigated by police, no further action was taken and that was the end of the story". Lord Steel said he had "assumed" that Smith had committed the offences, but said he took no further action because: "It was before he was an MP, before he was even a member of my party. It had nothing to do with me." Lord Steel also described recommending Smith for a knighthood in 1988 and said he did not pass on any allegations about the sexual abuse of children because "I was not aware of any such allegations other than the matter referred to?? ?which appeared to have been fully investigated". And he said it had not occurred to him that children could still have been at risk from Smith. In a statement released on Thursday afternoon, Lord Steel said: "I would like to clarify what happened in 1979 when I asked Cyril Smith about the report in Private Eye. "As I told the inquiry yesterday I did not have that report with me when I tackled him, nor did we discuss the details in it. "He admitted to me that the report was correct in that he had been investigated by the police at the time and no action taken against him. "I had already told the inquiry in writing that in my opinion he had been abusing his position in Rochdale Council [that is to gain access to council-run children's homes], but that had been properly a matter for the police and the council, and not for me as he was neither an MP nor even a member of the Liberal Party at the time. "I was in no position to re-open the investigation." The statement continued: "I am reinforced in my view by reading the previous report of the inquiry sent to me today, which says inter alia 'the Crown Prosecution Service found that the advice which had previously been given could not be faulted (given the law and guidance in place at the time)' and that the honours scrutiny committee had seriously considered his nomination for a knighthood and sent a 'warning of risk' letter to Margaret Thatcher as PM, and that 'clearly she took a similar view' as he was granted the knighthood. "It is unfortunate that some sections of the media have chosen to extract certain passages of evidence and present them without the full context. "The inquiry has a serious and sensitive job to undertake and spinning evidence to generate sensationalist headlines only serves to distract from panel's search of the truth." Richard Scorer, a specialist abuse lawyer at Slater and Gordon who is acting on behalf of seven victims in the abuse inquiry, said Lord Steel's admission that he assumed Smith had committed offences would "cause victims great anger". He added: "Steel's inaction was an appalling dereliction of duty and I hope the inquiry will condemn it in the strongest possible terms." Lord Steel became the Liberal MP for Roxburgh, Selkirk and Peebles in 1965, and became the party's leader in 1976 after the resignation of Jeremy Thorpe, who later stood trial on charges of conspiracy and incitement to murder. He was elected as an MSP when the Scottish Parliament opened in 1999, and was appointed as the parliament's first presiding officer. He has been a life peer in the House of Lords since 1997.